Emek Boru ships its first TANAP pipes! One of the few suppliers of TANAP, a project that delivers Azerbaijani natural gas to Europe, Emek Boru has its first production approved for shipment by TANAP. 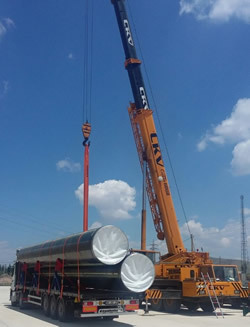 Having committed to approximately 12% of total TANAP Natural Gas Pipeline Project, Emek Boru realized its first shipment after being approved for its occupational safety, environment and logistics conditions by TANAP. 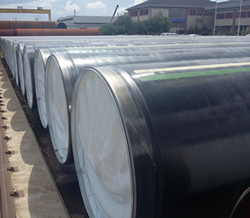 TANAP Pipes Ready for Shipment! One of the few suppliers of TANAP, a project that delivers Azerbaijani natural gas to Europe, Emek Boru has its first production approved for shipment by TANAP Having committed to approximately 12% of total TANAP Natural Gas Pipeline Project, Emek Boru realized its first shipment after being approved for its occupational safety, environment and logistics conditions by TANAP. Emek Boru plans to complete all shipments of this important project on March 2017. Emek Boru in Full Support of Education! “Statistics Career Days” event organized by the Gazi University Statistics Community on 12 – 13 May 2015 was sponsored by Emek Boru. Emek Boru supported such events for encouraging young graduates to develop themselves in professional sense and have an insight on their future possibilities for their career. Emek Boru joined in excite of young in Red Bull Flight Event! Emek Boru sponsored Red Bull Flight Event and shared excite with young people. After the long lasted preparatory period of the flight, the group Angara Börds completed a successful flight at the end of this big and important event with its accompanying sponsor Emek Boru. Emek Boru kick off for Tanap Pipes! Producing spiral welded steel pipes used mainly in transportation of natural gas and water and celebrating its 60th anniversary last year, Emek Boru A.Ş., signed the contract on October 2014 for TANAP project for supplying main line pipes for this very important project for Turkey. Of this project with 1850 km length, Emek Boru A.Ş will supply more than 360 km of pipelines together with a consortium in which it has approximately 50% share. In total, Emek Boru committed to produce more than 115 thousand tones which corresponds approximately to USD 125 million USD.